I wanted to join in the fun! This is "Kent" by Wedgewood. full of some Irish luck and blessings. is Romantic England, Herefordshire, by Meakin. Romantic England, Haddon Hall by Meakin. of green transferware from England. 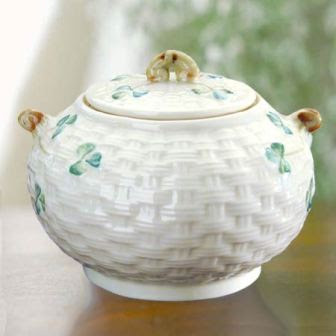 I found these images of beautiful Irish Pottery. Hope you all have a good St. Patrick's Day! This is gorgeous! For a minute there, I thought you were packing that beautiful basket up to send it to ME! Happy St. Patrick's Day and may the luck of the Irish be with you!!! Thanks for finding me and bringing me over!!! I'm off for a walk but I will be back to discover all your beauty!!! Hi Debra, I love your "Kent" china! Happy St. Patrick's Day! Oh wow...I just love that transferware. The platter is just fabulous...it all is! Thank you so much for joining me today! Just love that transferware! It is so pretty in green and so fitting for St Pats day. Lovely post. Well Debra, this post will put me in St. Patrick's day mood! Green everywhere! Love the basket full of goodies. Have a blessed day my friend! Love the picnic basket display! So creative and BEAUTIFUL! I love transferware! Have a great St.Patrick's Day! There is some Irish somewhere in my family~we keep it simple~green pancakes for breakfast! The kids just love it! What gorgeous St. Patrick's displays, Debra--I love it alL! Hope you're having a beautiful day--thanks for sharing with us! You are so talented. I am amazed how you keep churning out wonderful, beautiful and thoughtful posts. I look forward every time to seeing what you put together for our enjoyment. Have a wonderful green day!! What a beautiful display of your dishes. 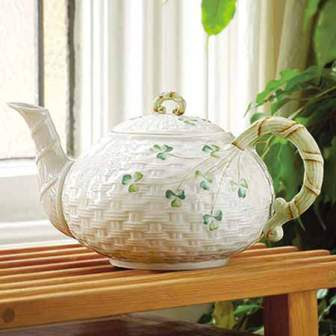 I am in love with the green transferware. I love it all. Very beautiful! Definitely a lovely picnic! Happy St. Paddy's Day and WW as well. LOVE the basket display...and I have no Irish in me!!!!! It's so cute!!!! I love your Irish picnic tin! All your dishes are so beautiful! Gorgeous Debra! Love the finishing touch with the teapots!! you always have the BEST collections! happy st. patty's day! Are you wrapped in chicken wire at your booth? Send out an all points bulletin if you need me. Those green and white dishes! I gasped at your beautiful picnic tin! Wow, I really need one of those myself. We have been busy getting ready for St. Patrick's Day around here also. The kids went leprechaun hunting tonight, it was fun watching them run around with their butterfly nets. Have a good St. Partick's Day! Kate AKA "One of the Crazy Girls Up North!" And yes, that is actually a fairly accurate description! OMG Debra! You have some absolutely gorgeous dishes! I am so in love with each of them!! Beautiful! Oh, your transferware is awesome! I just love it. All of your pictures are so pretty. Come by my blog and enter for a chance to win Rachael Ray bake ware. I swear, you have *stuff* for every occasion and holiday! Your collections are absolutely amazing, I really only have a fraction of the nifty treasures you possess! Wonderful tin loaded with great green goodies. Love the plates and that gravy boat...divine! Nice collection of vintage postcards as well. The green transferware platter is so so pretty! Hi Debra, those wedgewood plates are to die for!! just beautiful! Happy Patrick's Day! What a nice collection of green...I ♥♥♥ the John Maddock and Sons platter, just beautiful, but then I love anything green! What a beautiful basket of "green" goodies. (I have that same tin basket :) Very pretty stuff. Love the picnic tin with all the Irish Blessings and green. Very pretty things. Happy St. Patrick's Day. I think I am just a little green with envy...that transferware is 2die4 as is your tablescaping talents! A blog crawl? That's about the only way I'm getting around now, I'm so tired! P.S. If I got pinched, I'd never feel it. I'm numb from the eyeballs down! Your picnic basket looks ready to go. Love your china with the green on it...very lovely! I would love to picnic with you - that basket is delectable!! I love your green and whites today. Happy St. Patrick's & White Wednesday. What a fun St. Patty's Day post. The transferware dishes are great. Great post. Fun to have such pretty reminders of your legacy around you. I love absolutely everything you have shown in this post! The green and white is gorgeous. Debra your English china is absolutely gorgeous. I have got to go back through this post and look at it all again. What a beautiful collection! The gravy boat got a big sigh from me. Love it! I've always wanted a parterre like your header sketch. It is so lovely as is your darling vintage illustrations and transferware . 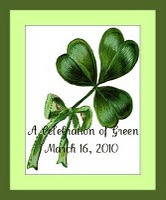 I am glad you believe we all have a little Irish in us because the St. Patrick's Day festivities in blogland make me want to join up. 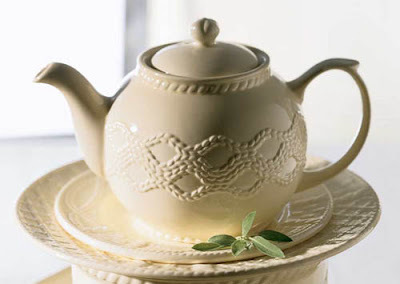 Oh your dishes are lovely and I just love Belleek. Thanks for joining in the Blog Crawl..I just loved your sweet post! You WON Debra!! Thank you for playing along in my Celebration of Green! Let me be the first to congratulate you! I'll be in touch so I can get your shipping address for your prize. Congratulations on winning Jamie's give away. You have some beautiful things. I wish I lived closer so I could visit your booth!